Costumes are to the Carnival season as peanut butter is to jelly — indispensable. We encourage you to consider wearing one, or at least to accessorize with a sparkly headdress and some feathers. At the very least, wear something in the Carnival colors — purple, green and gold. Not only will it get you into the Mardi Gras spirit but you will fit right in. Here are our tips on how to dress for the Carnival and where to get the best costumes and costume-making supplies. Think about what you want to wear while visiting New Orleans during the Carnival before you pack your bags. There’s no dress code unless you’re attending some Mardi Gras balls or certain parties, and pretty much anything goes. Thinking ahead will ensure that you’re comfortable but also feeling good about what you’re wearing during your visit. Also think ahead about transporting your costume if you’re bringing one. Will the headdress fit into the suitcase? How do you pack your mask so that it makes it to New Orleans in one piece? No costume? No problem! You can pick up one up here, rent one, or make one. New Orleans is a costuming city, with plenty of options (see our shopping recommendations below). If you want to really enjoy Mardi Gras, dress comfortably. It’s a long party and you’ll likely be doing a lot of moving around, attending multiple events in one day, and spending a lot of time outside. You will likely also be standing on your feet for hours during parades, so bring comfortable shoes. And expect to walk a lot if you are watching any parades. The streets on and near the parade routes will be closed off, traffic will be congested, and cabs might be hard to come by. Do pack some heels though if you plan to attend any formal events. The only thing predictable about New Orleans weather is that it’s unpredictable. February temperatures have ranged from 48° to 65°. Dressing in layers would be wise. Carnival takes places at the end of winter, and some Fat Tuesdays have been really cold while others were positively balmy. Also, check the weather. If there’s any chance of rain, be sure to pack a raincoats, rain ponchos, umbrellas, and rain boots. 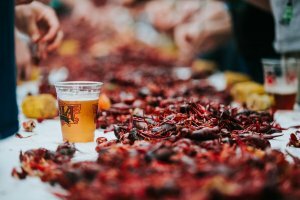 Mardi Gras muck is a thing, especially if it rains, so rain boots will save your shoes from being ruined by the festive mix of mud, parade debris, and thousands of feet. Choose a bag that fits your needs. You’ll need to carry your essentials like phone, wallet and phone charger, of course, plus a bag for throws if you’re attending a parade. But also consider packing water, an umbrella, and things you’ll need throughout the day without returning to your hotel. Snacks and beverages along parade routes are available, but you may not want to leave your spot or wait in line. Also, and that goes beyond saying, despite a very visible police presence during the Carnival it’s best to leave your valuables and precious jewelry at home or in your hotel room. Things could get lost or stolen when you’re out and about with the thousands of other revelers. If you want your costume to stand out it will have to be truly fabulous. The bar is very, very high in New Orleans, and people here take costuming very seriously. A costume will be a must if you’re riding or walking in any parades. This doesn’t mean your costume shouldn’t be comfortable, of course. Mardi Gras is a marathon, and a lot of it is spent in the streets and getting yourself from point A to point B for another parade, party or ball. Choose a costume that will allow you to fit into the doorways, use a public restroom, won’t fall apart at the end of the day or cause scrutiny (the bar for the latter is very low in New Orleans though — only truly offensive and outrageous costumes would get any kind of negative attention — pretty much anything else goes, the crazier the better). Accessorize wisely. Don’t let the accessories weigh you down. You have some serious partying to do, for long stretches of time. Consider wearing a mask. You’ll notice that a lot of people wear masks, especially on Fat Tuesday. If you aren’t making one, there are plenty of places in New Orleans where you can buy one, from an inexpensive mass-produced one to an exquisite thing of beauty made by a local artist. See our suggestions below, and happy masking! Finally, don’t feel like you need to conform. The point is to be yourself and feel good about wearing your costume. This is the perfect time to live in the moment and be free. A funky-glam French Quarter institution with a very impressive collection of wigs (that you’ll get to try under the guidance of one of the shop’s helpful employees), plus costume accessories and makeup. Be warned though, this is THE wig stop for many, so expect a line in the days leading up to Fat Tuesday. Just steps from Jackson Square, Maskarade can meet all of your masking needs with its vast selection of handmade Italian masks (Venetian style) as well as a collection of masks done by the local and national artists. If you want a simple, inexpensive mask in the traditional Carnival colors check out the souvenir shops that pepper Decatur Street. They also carry festive hats, feather boas, and shirts in purple, green and gold. It’s an easy way to throw on some dazzle without breaking the bank or going all out on an elaborate costume. The shop’s name mentions Halloween, but don’t let it deter you as it carries accessories, novelties, masks, makeup, body paint, and wigs that come in handy for other occasions. This is a funky novelty store with a sister store called Pop City, at 940 Decatur St. Both sell collectibles, toys, accessories, and clothes. This gem specializes in new and previously owned handmade costumes and has locally made artwork on consignment. It also carries supplies to make your own costume, like feathers, sequins, trims, and hat forms. You can sell your costume there, and hire a costume designer. This bustling neighborhood market is held on the second Saturday of every month at the New Orleans Healing Center, and is as New Orleans as it gets. 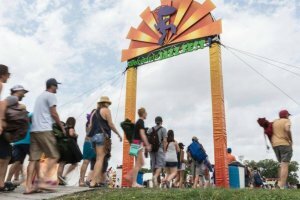 This is a unique opportunity to grab a fabulous creation made by some of the best artists the city has to offer (the extensive vendor list is basically a who-is-who of artistic New Orleans). Some of the most beautiful headdresses you will admire on Fat Tuesday probably came from Piety. The prices are beyond reasonable, and several vendors are usually on hand selling vintage and secondhand costumes and accessories. Try some delicious pop-up food while you shop, too. If you don’t mind rummaging through an overwhelming inventory of oddities, vintage accessories and thrift-store fare this treasure trove is for you. There’s an occasional traditional costume that belonged to a float rider, or a unique, locally made creation on consignment. Also, check out the amazing Mardi Gras Indian headdresses mounted on the walls. How would you like to wear a costume that has been used in an Oscar award-winning film or an acclaimed TV series? Come browse the 9,000-square-foot warehouse brimming with everything from period costumes to the ever-popular pirates, animals, and everything in between. 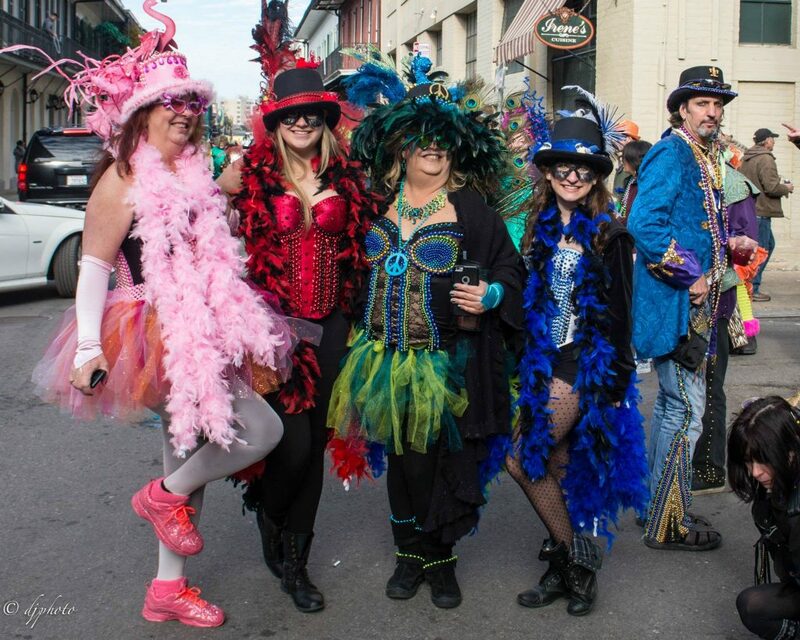 Southern Costume Company dresses Mardi Gras krewes too, so you know you’re in good hands. You can also order a custom costume made, and there are seamstresses on-site. And the costume rental prices are reasonable. Despite its name this shop doesn’t carry costumes but is a solid choice if you want to make one. There you’ll find all kinds of supplies, from trim to sequins to beads and feathers. Brought to you in 2018 by three Muses (Nori Pritchard, Virginia Saussy and Lisette Constantin), NOLA Craft Culture is a dream-come-true for the costume-makers who had trouble finding specific craft supplies like micro-glitter, hot glue in different colors or fine-point glue guns. The shop is packed to the gills with feathers, sequins, rhinestones, appliqués, and lots and lots of glitter. There are also umbrellas, confetti, 5-foot-long ropes of hot glue, and locally-sourced glitter makeup and lashes. Nyx purses and Muses shoes grace the space. What makes this women-owned and operated shop truly unique is that it aims to become a space for classes, workshops and community crafting. Anyone who makes a purchase can also complete their projects on-site in the downstairs craft room. If you ever tried to get de-glitter your home after completing a project you will understand how brilliant this is. This compact yet comprehensive store offers costumes, dancewear and accessories like wigs and hats. Small but mighty, Miss Claudia’s is a goldmine filled with majorette boots, funky vintage costumes, dazzling accessories, and other Mardi Gras essentials. Come Mardi Gras this resale boutique is your destination for seasonal gear like vintage ballgowns and eclectic accessories. Also, check out our guide to the Mardi Gras Weekend, the 2019 Mardi Gras Parade Schedule, and our tips and recommendations on How to Dress for Mardi Gras Parade Rules and Tips. Happy Carnival!